Apartment dwellers and urbanites often lament the lack of options for composting in homes with limited yard space. 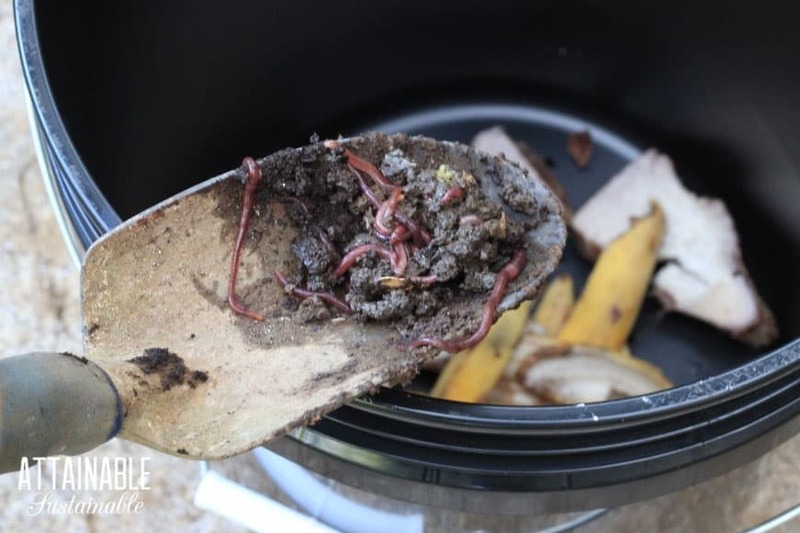 If you’re not the kind to get all squirmy over worms in your house, I highly recommend worm composting as a method for dealing with your kitchen waste. You can buy ready-made worm bins, but if you’re even a little bit handy and have access to a drill you can make a vermicompost bin yourself for under $5. You’ll need a couple of 5-gallon buckets to make this project. Check the local bakery for inexpensive buckets — they often sell the ones that their ingredients come in for just a couple of bucks. Worms like it dark. If you opt to use white or opaque buckets, you should cover the worm bin with an old towel or tarp to prevent light from permeating. 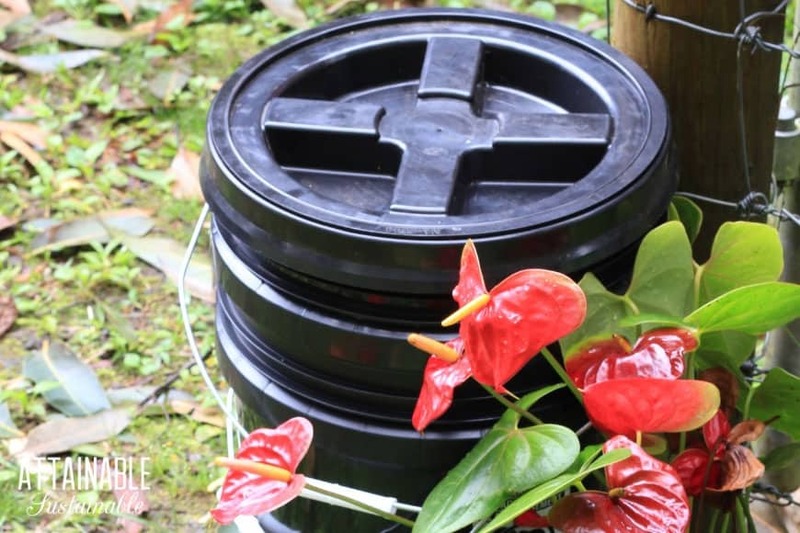 Black or solid colored buckets will prevent sunlight from bothering the worms. Not all worms are created equal. For this project, seek out red wigglers. They thrive in worm bins and gobble up the kitchens scraps that you generate. You can order composting worms online. If you’d like to stick closer to home, though, talk with your local garden club or farmers market people. If you can find someone with an established worm bin, it’s easy for them to pull a handful out to share. 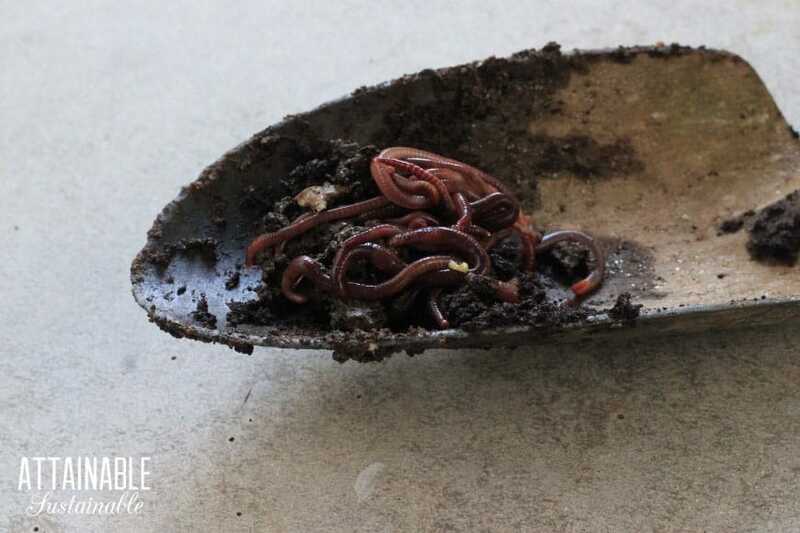 Once you’ve acquired worms, you’ll start with a handful or two of fresh kitchen scraps and shredded newspaper. It takes less than half an hour, start to finish, to put this vermicompost bin together. While your wormery is getting established, don’t overdo it on adding waste. Add 2-3 cups or so every couple of weeks. Once a brown base develops under the paper (this is the worm castings, aka worm poop), you should be able to add a bit more. The worms will multiply based on how much food is made available to them. This vermicompost bin takes up about a square foot of space and fits under most kitchen sinks. And I promise. If you’re doing it right, it does not stink. When the top bucket begins to get full, you can add a second perforated bucket. Just add moist newspaper and scraps like you did during set up, and set it onto the stack. Make sure the top bucket rests on the waste in the bucket below. The worms will slowly migrate up through the holes. When the contents of the first bucket are no longer recognizable, simply pull out the middle bucket and use the rich worm castings on your potted plants or in your garden. The worms will have migrated up and you can use the castings directly from the worm bin. To harvest the castings without adding a second bucket, dump the contents into a large piece of cardboard. The worms will move down into the castings and unfinished kitchen waste, away from the light. Lift away large pieces of scraps. Skim off the top layer of worm castings using a garden trowel. Wait a few minutes for the worms to move deeper, and skim some more. 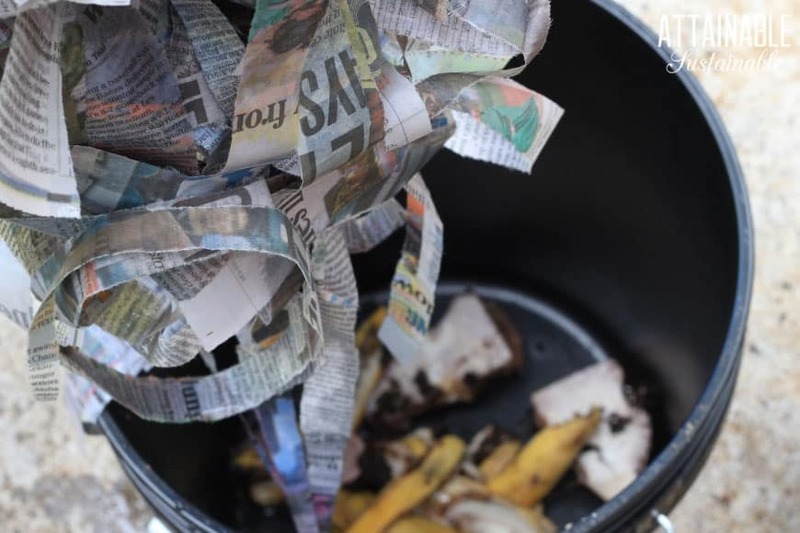 Continue until you have harvested most of the castings, then put the worms back in the bin with fresh scraps and top it off with damp newspaper. Vermicomposting allows you to turn kitchen waste into a rich garden amendment. A worm bin -- a layered unit that houses worms who will eat your garbage -- doesn't take up much space, it doesn't stink, and the worm castings are very high in nutrients. Drill 10 to 15 holes in the bottom of one of the buckets. This allows excess liquid to drain. Add several handfuls of kitchen scraps to the bucket. Place the red wigglers on top of the kitchen scraps. Shred newspaper. Thoroughly wet the shredded newspaper; allow to drain for a moment then place it atop the worms to a depth of about six inches. Put the bucket with the worms inside the second bucket and put on the lid. The bottom bucket serves the purpose of catching any liquid that leaches from the active bin. Add a handful of scraps every two-to-three weeks, tucking them under the newspaper. As the worm colony grows, they can process more scraps. Add more when the worms have eaten through most of the scraps in the bin. The worms will multiply based on how much food is made available to them. When there's a substantial amount of dark brown worm castings, it's time to harvest. Stop adding new scraps for a few weeks. 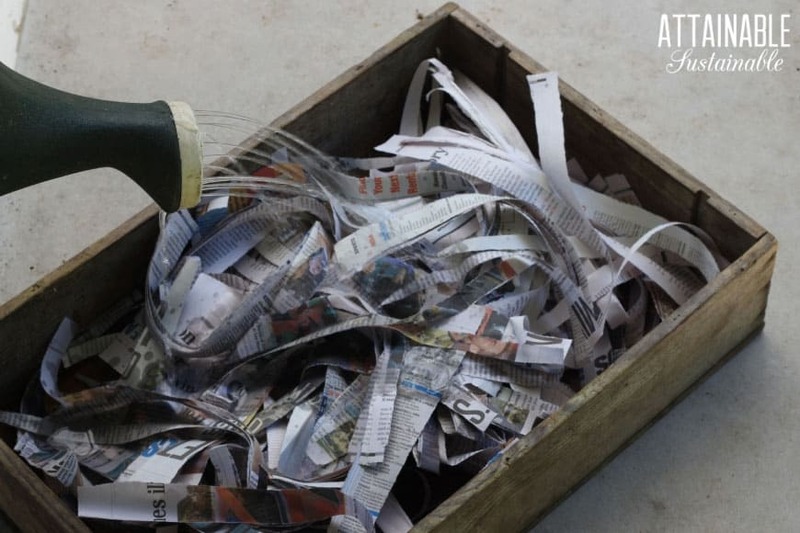 Dump the entire contents of the worm bucket onto a piece of cardboard and expose it to sunshine. The worms dislike light and will crawl to the bottom of the pile. Carefully remove castings from the top of the pile, repeating several times until you've harvested most of it. Put the worms back into the bucket, and start anew. A worm bin of this size is best suited to a single person or couple. You can use the same method with large plastic storage containers for a larger household. When the top bucket begins to get full, you can add a second perforated bucket. Just add moist newspaper and scraps like you did during set up, and add it to the stack. Make sure the top bucket is resting on the waste in the bucket below. The worms will slowly migrate up through the holes. When the contents of the first bucket are transformed into worm castings, simply pull out the middle bucket and use the rich worm castings on your potted plants. This sounds great for city living. Thanks for the tip. What an easy and neat way to have a vermiculture system! 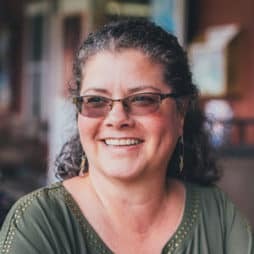 Mahalo, Kris! Hmmm – now where to get the worms w/o spending $20. You actually need red wiggler worms. The ones in the fishing stores usually aren’t the same kind. At least I have never seen red wigglers in the fishing stores. Go outside and dig up the worms, the world if full of them. It certainly won’t hurt to try, but garden worms like to burrow whereas red wigglers are content to stay in tight quarters. The worms will multiply in relation to the amount of food available. Increase their food in increments, and you might need to increase the size of the container. Our bait stores in southern Ohio do sell red wigglers, so you might want to check yours. Bait and tackle shops usually have red wrigglers. I learned an amazing trick. Find a nice damp spot in the garden where the dirt has been shifted through and fluffy dig a little and see if you find any local worms. Usually you see a few. Dig a home, bury some used coffee grounds and wait a week. Then dig it up and you will have a huge supply of healthy, local worms suitable for living in your area!!!! It really works. My daughter went off to college in Portland and came home committed to organic gardening, and she started worm composting in her dorm. I’ll show her this post and see if she wants to implement this here at our house, thanks for the plan! My son is off to college and utterly disturbed to not be composting. I suggested this plan to him, too! That’s a great idea, but with the buckets being translucent, I hope you’re keeping them in a dark closet. As you know, worms hate light more than onions. That’s why opaque bins or totes are recommended. If they are under any kind of stress caused by light, they will hunker down in the middle while leaving the lighted areas alone (as far as feeding goes). Under the sink? I’d say that’s plenty dark, yes? Thanks for the worms and great post! It’s a little weird how excited I am. Over worms. I’ll only worry when you start naming them. So interesting. Forwarding this to a friend, a former rural-dweller, now an urban-dweller. She will be so happy to find a solution to missing her composting! Sheryl, this can definitely fulfill that need to compost in small space situations. I hope she tries it! I’ve got three of these (Rubbermaid totes) in my back yard and I swear they do a much better job than a traditional composter. I had my sixth grade class do this as a project two years ago and we even made the news – It’s really a great project. did you drill more than one hole for the totes?? wondering? does it need to be a certain kind of plastic? or can you use any type of tub? Any type of tub should work. I’ve seen something similar done with Rubbermaid containers as well. If you’re keeping your bins outdoors, look for tubs meant to be outside — like small trashcans. I bought some bins that I get compost and manure in from local farms and they get brittle very quickly if they are exposed to sunlight. Avoid adding meat — it’ll get stinky. I use a Rubbermaid 3 gallon container (with lid) sitting on a tray (to catch stray worm escapees). The setup sits on top of the recycling bins in the kitchen. Don’t feed onions, citrus or fruit, or meat/protein scraps. (You can feed fruit if you like those nasty little fruit flies flying around the kitchen – I don’t.) I cut up the food as fine as I can with a sharp knife. And yes, they do like those slimy things from the back of the crisper drawer. If you have Freecycle or Nextdoor Neighborhood in your area you could try asking for surplus worms from an existing vermicomposter. For example, I started with a cup of worms less than 2 years ago and have now raised enough to start off 6 bins for other people. And very soon I’ll have to split off another batch of worms. I would love to do this. I live in Phoenix and am wondering if I should keep this inside uear round or if cooler months if it could go into an outdoor shed? Mine are outside, year round in a temperate climate. You just want to keep them from the extremes – super hot weather and freezing cold. I keep mine in the garage (unheated) all winter. As long as it doesn’t freeze they are fine. I started one of these about five days ago. Opened the lid to put stuff in today and there was a butterfly on the inside lid! Anybody have any ideas where it came from??? Or paint the buckets to create the dark space. ** Ask your local bakery for a couple of buckets, they will usually give them to you for free! 1/8th inch holes are big enough for the worms to move through if you decide to stack buckets? Should be – they get pretty skinny! If you’re concerned, though, bump it up a size or two. So grateful for the red wigglers you gave me a couple years ago. I now have two worm bins and LOVE IT! They go crazy if you grind up their food in a food processor. They multiply prolifically. I have since shared my worms with others, like you did with me. I get all the “juice” out every two weeks, add water and fertilize my plants. MAHALO! Youʻre so funny. But I get you. They are so nice to have, and Iʻm glad youʻre passing them along! I’ve had my “worm farm” going for about 2 years. When I do a big vegetable tray and have a lot of veggy waste, I put it in my blender and make “worm slaw.” Then just dig a trench in the worm farm and pour it in. The worms go crazy because it is so easy for them to eat. I found it so much easier to do this than to try to bury the pile. I use wet peat moss instead of newspapers. Then I can just mix it with potting soil or regular ground soil. I have mine in 4″ deep totes. It gives me plenty of room to bury coffee grounds, egg shells, and veggy scraps, really anything besides meat or meat products . The down side, of using this size tote, is lifting to get to the bottom tote. Peat moss sequesters carbon, which is released into the air when used in the garden, contributing to climate change. It is harvested from beat bogs, very cheap to harvest, cheap to buy, but each of those bogs supports enormous amounts of critters that lose their homes when the peat moss is harvested. The shipping from where it is harvested to your local garden store also contributes to climate change. So using peat moss contributes to climate change in three huge ways. Please, please, do not use peat moss in your gardens, for anything. Or in anything. I have stopped buying potting soil that contains peat moss for this reason. I learned this when making a cranberry bed, which recommended lots of peat moss to create a bog like environment. My research led me to use coconut coir to hold the moisture. Along with other recommended nutrients, I added mycorrhizal fungi, which peat moss has but coir doesn’t. Do you have to empty the liquid from the bottom bucket? Does the system get dirty after a while? I imagine creating a big mess when taking the top bucket off to empty the bottom bucket. If itʻs working, the active bucket should be just moist, not sopping. 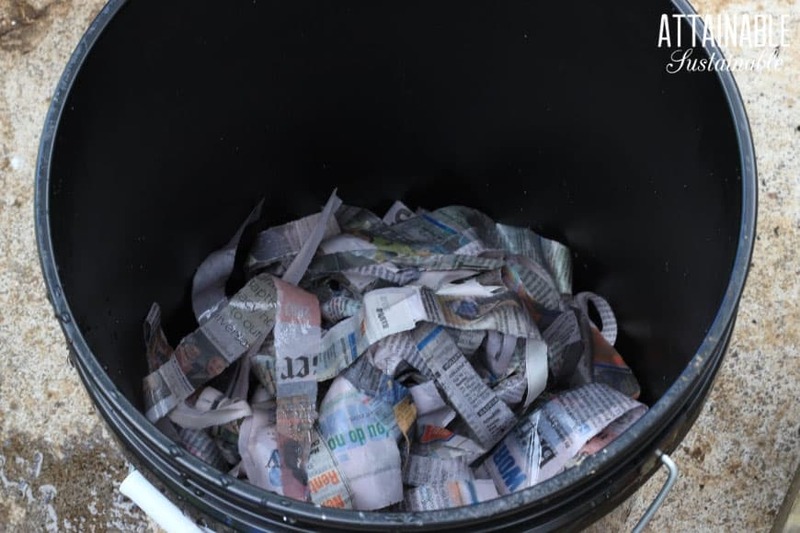 You just lift it out of the lower bucket, set it on a piece of newspaper and empty the lower bucket – hopefully into a watering can where you can dilute it (I use *roughly 1 cup of worm juice to a gallon or so of water) and use it to feed your garden. Can the bucket live outside? I live in a small apartment in Georgia. The winters are not ridiculous, but I’d imagine still colder than worms would prefer. How tolerant are they? I’ve had mine outside in Northern California winters with lows of 14 degrees. 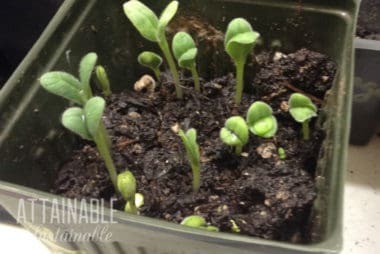 check out unclejimswormfarm.com. I’ve bought mealworms to raise for my chickens and will be getting my wigglers from them as well. Great post. I.started with my DIY compost bin about 2 months back and used pots (plants’ pot) because I don’t own a drill & and these already came with 3 holes! Set it on a pot holder and left it out in my garden. 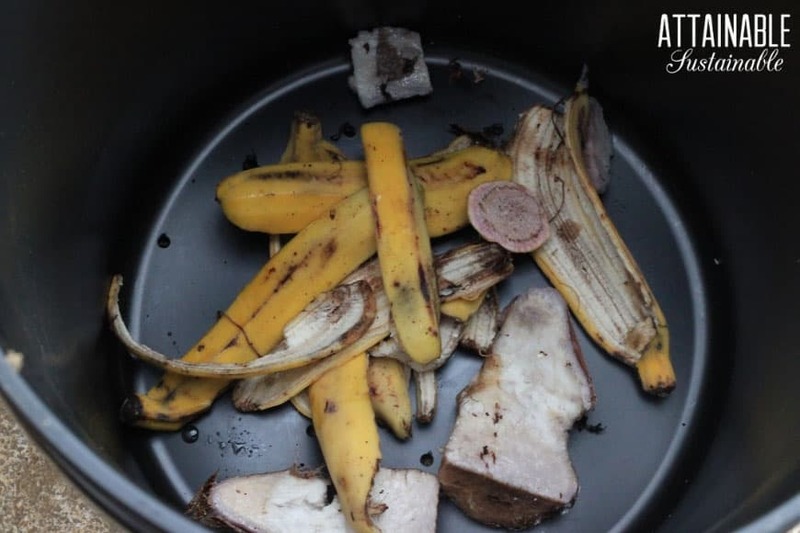 Been adding my raw (no meat) waste to it without any worms and discovered it has fungus and would like substance growing on it 🙁 I live in a tropical climate. The only extreme weather is heavy thunderstorm but mine bin is covered. Am I doing it wrong? Can I buy and add some wriggly worms to it now or do I need to start fresh? Fungus and mold are all part of the breakdown process. Hard to say without looking at it, but I think you could add worms now. What do you mean by “find a chicken helper”? what do you mean by “get a chicken helper”? I live in Ohio would it work to put the bin in the garage in the winter or will that even be to cold? You want to keep them above 40 degrees or they’ll die. I have been wanting to start composting and to find something useful to do with all of my empty tidy cat containers. Now I have the solution to both! Thank you! 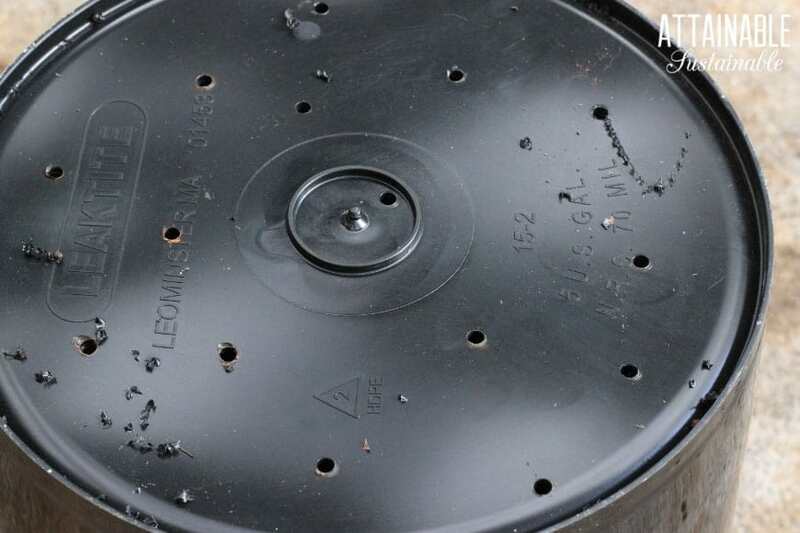 I may have missed it, but are holes drilled in the bottom of the top/second container also? I love the idea….however, are there any alternatives for containers. Plastic leaches nasty chemicals into your compost making it unusable. You can buy wooden worm composters online. Are the rubbermaid tubs food safe? They’re not food grade, no. Hey, I just made one, but you don’t say anything about letting oxygen into the bins. Should I drill a hole into the top? Not in the top, no. I can’t wait to do this. So how about giving the worms some old leftover great bean casserole? Do they eat the newspaper too? Do I lift up the newspaper when adding more kitchen scraps and put the scraps directly on worms/castings? I am brand new to composting. Everyone is mentioning digging trenches and getting the scraps down to the worms. Thx for taking the time to post this and for answering our questions. Yes, they eventually eat the newspaper, too. Amazing. And yes, just lift the paper and tuck your kitchen scraps right onto the waste. Usually the wet newspaper is just used at the start. It will last for a couple months; by then, the worms will have created a nice “bed” of vermicompost that they’ll hide in. Use newspaper every time you start fresh, though. Worms can’t eat onions, citrus dairy or meats. I’ve had red wigglers for 3 years or better and they are doing quite well. If your going to use them in your vegetable garden don’t feed meat or feces from anything that consumed protein. Chicken, goat, lama, cow or horse would be perfect but you have to smell it too. Yes, but fresh manure can produce too much heat when it’s breaking down and I’ve also heard that it’s too acidic for the worms. In the uk your red wiggley worms are called tiger worms and you don’t need to buy them. They live deeper in the soil than regular worms. If you put your buckets outside after you put your kitchen scraps in as they say, ‘if you build it they will come’, if it works here I don’t see why it shouldn’t for you. Question, I eat fruit everyday so I have banana peels, strawberry tops, etc. Do I just drop them in everyday or save them in the fridge and do them once every couple weeks? Also, apple cores and fruits with seeds, can I add those or will a tree grow?? Haha. Thanks!! You can drop them in as you have them, but be aware that you CAN overwhelm a colony with too much. That said, it’s pretty cool that worm eggs won’t actually hatch until they “know” that there’s enough food available. I tried the double and the single bucket method but both scenarios, I couldn’t keep the worms in the buckets. Think I need something air tight. I suspect that they’re leaving (or trying to) for a reason. Too dry? Too wet? Too hot? I do have an occasional few up at the top of the container, but not mass exodus. Its likely that the environment is acidic. I came across an article about vermicomposting and that was one of the reasons wroms might try to leave the bin. Try adding more paper to the top and less acidic foods to the bin like crushed egg shells, veggies like potatoes or lettuce. Remember not to use printed paper other than news paper as the ink is also acidic in many cases. Im starting my first worm farm this weekend but this is some of the information I have come across in my research. How long would it take for a worm hive to produce usable tea and castings? 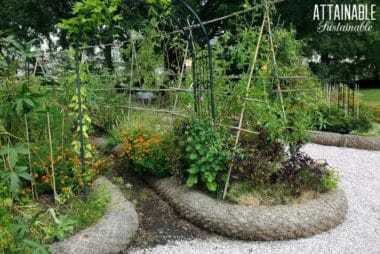 If I were to start the worm bed now, would I be able to feed about 40 plants this season? It depends on a lot of factors. When you say “this season” I assume spring in the US. My short answer is yes – you’d be able to start pulling castings by then; at least enough to use to brew some worm tea. I watched a presentation the other day and the presenter (with an established system) was harvesting castings in a week. One thing he does to make it move so quickly is to grind everything before giving it to the worms. This way, they process through it faster. So that would be one way to speed up the process to have more for spring! I made this a few months ago because it was the perfect solution to my small apartment. I’ve tried other setups before but they were too small, so everything I did wrong was magnified and I ended up killing the worms. But this is PERFECT. I can have multiple set-ups throughout my apartment. Thank you so much for this! I noticed you only put holes on the bottom of the bucket – the worms are able to survive like this? I live in Colombia and want to create something similar using plastic trash cans to put on my balcony. Do I need to drill any holes on the sides of the cans or will the worms survive just fine on the air inside the container? You could easily add a few holes in the side of the bucket, too, if you like! Do you have to stir the bins every so often? Do the worms take care of that part for you? The worms do ALL the work! The only time I fiddle with it is to harvest the castings. It seems as though it would take forever to get any measurable amount of compost if all you add is 2-3 cups of waste every couple of weeks. Think of all the potato peelings alone you are throwing in the trash every day because you can’t put them in the worm bucket. And that’s just potato peelings! If you create a lot of waste, you could definitely use this method with a larger container. Walmart has red wrigglers for $3.88. I don’t know why it wouldn’t. Just keep it in the shade during hot times and make sure the moisture level remains good. How do you know when you have too many worms and need to share or make another bin? The worms will moderate their population. They won’t overcrowd themselves. 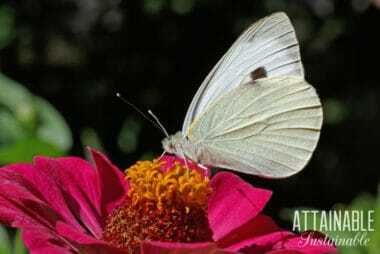 They lay eggs that only hatch if there is sufficient food, according to a worm expert I talked with years ago. If you have lots of waste, make another! If you have the space available, plastic storage bins with lids are great for composting. We have 3 sets and have enough worm casting to share with our gardening friends. Vermicomposting is great fun. What is the ideal temperature for this worm composting? I have a basement grow room that I keep at 80-85°. That should work fine. I find that when it’s warmer than the worms like, they’ll burrow closer to the center. What size are the containers in your picture? I’m trying to determine the smallest size one could use for worm composting. You might try a fishing supply store if you have one nearby. How do the worms get oxygen? There are holes in the side of the bucket. If your buckets fit together really tightly, you could use a block to prevent that. The instructions only say to put holes in the BOTTOM of the top bucket. So you now say there needs to be holes in the sides of the top bucket also? How many? How far apart? All the way to the top, or halfway, or less? Just trying to get this straight so I can try this, but do NOT want loose worms in my home! What is the temperature suggested for this method? I’m assuming we would want to keep the worms in a dark bucket somewhere where the bucket will not overheat, is that correct? You want to keep them from extreme heat — so a shady spot — and extreme cold. They’re pretty hardy, though.